Located about 80 miles in the northeastern region of Udaipur near the peripheries of Mewar, Marwar and Merwara, Deogarh is a picture perfect place for spending the vacations on a tour to Rajasthan. Deogarh is equally popular for the school of miniature painting. This beautiful city is bounded by the stunning Aravalli mountain ranges. To get a royal touch of stay during the vacations in Deogarh, hotels in Deogarh is the perfect destination for the tourists. These hotels have well designed rooms with the latest interiors and well equipped with the latest of facilities and amenities. The serene as well as strategic location makes Deogarh Hotels some of the most chosen ones among the hotels in Rajasthan. Deogarh being a good tourist destination is visited by a large number of tourists from the different parts of the world and hence make for some of the best accommodations in Deogarh. The climate of Deogarh is relatively cool as compared to the other regions of Rajasthan and is the best for the sightseeing tours of the city. Deogarh is renowned for a majestic 17th century structure. The high altitude of Deogarh makes for a panoramic view of the splendid Aravalli hills. There are numerous lakes surrounding the city that can be viewed from the majestic forts. Hotels in Deogarh have spacious rooms that offer the view of the surroundings of the hotel and make for a comfortable and pleasant stay for the guests. Amidst the warmth of hospitality in the traditional Rajasthani style the scrupulous and cooperative staff of the hotel offers the most personalized services to the guests. Deogarh Hotels are not only known for the excellent services and facilities but they are also known for the excellent dining options. The air conditioned multicuisine restaurant offer the best of the delicacies that are prepared in the authentic Rajasthani and International flavors. Hotels in Deogarh are also the perfect venues for business and banquet facilities. The spacious banquet halls of the hotel serve the purpose of holding the carious functions. For the business guests, the hotels have state of the art conference halls that are well equipped with the latest facilities. 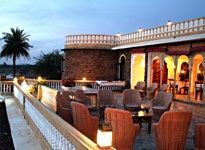 These accommodations in Deogarh also make the arrangements for the sightseeing tours of the city and are thus known for the various other services such as baby sitting, jeep safaris, desert safaris, live entertainment, camel safaris, horse rides, special picnics, cycle rides, theme evenings, safe deposits and car rentals, money change and many more. Deogarh is one of the best options for spending the vacations and include battlements, domes, turrets, jharokhas and huge gateways to mention some of them.